Now is the time to get a Ph.D. in Rec Therapy! 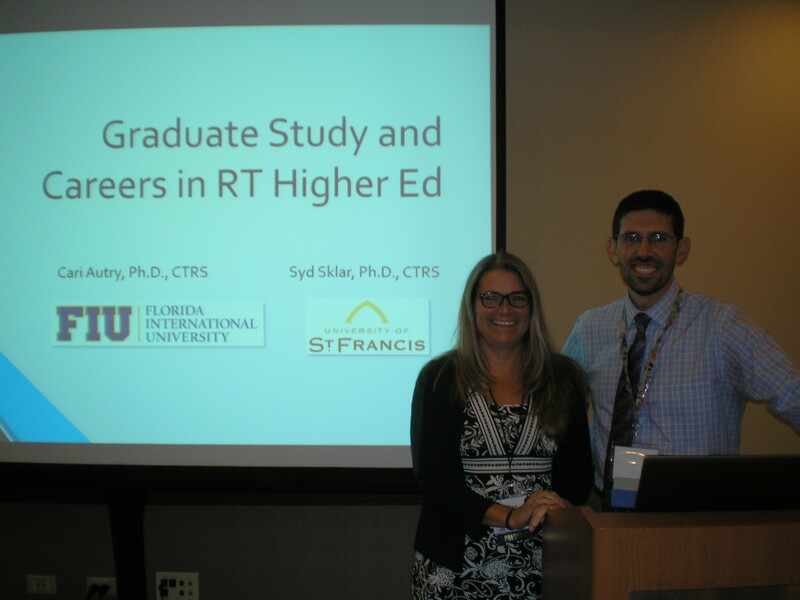 I had the wonderful opportunity to attend a training session titled: “Graduate Study and Careers in RT High Education.” This session was presented by Cari Autry, Ph.D., CTRS and Sydney Sklar, Ph.D., CTRS on Sun. Sept. 11, 2016 at the ATRA conference in Chicago. Cari Autry and Sydney Sklar both received earned their doctorate degrees from Florida International University. Recreational therapy is lacking faculty, particularly those with doctorates in RT higher education. They suggested that we in the audience could be the key to the survival of our profession. They high recommend for others to get their doctorate or master’s degree. There were several of us in the room who already had a master’s degree, including myself, and one girl from Iowa. There were several students in master degree and doctorate programs. DannyPettry: I’m very pleased and happy to see so many people doing this. The need is high. According to a recent study, there were only 9 doctorate students in 2009. Recently there were 12 open positions at colleges and universities needing an individual with a doctorate. In a nutshell: we need more professors. Overall, a person with a Ph.D. and CTRS credential is pretty much guaranteed a job due to the number of positions that are needed. A person with a Ph.D. in a related field with CTRS and background experience in Recreational Therapy would also be well-suited for these positions. Those with a master’s degree in the field and with experience working in the field would be eligible for adjunct faculty positions. They recommended those with M.A/ M.S. degree to volunteer to be a guest lecture for a day at these colleges. This could be a good way to get your foot in the door. DannyPettry: if you got a full-time position as faculty with master’s degree then you might want to work on earning your doctorate while teaching and being on campus. What does getting a doctorate degree take? There are a lot of classes on statistics. I suggested that Syd S. to write a book, statistics made easy for people. Summer off (Dr. David Austin sent me a message and said that few have summer off). Based on my personal experience: I took summer classes every year so I know a lot work during the summers too. Jobs outlook claimed that an assistant professor salary is: $65,372. Of course this will vary/ range. 2013: The Economists: RT least likely to be replaced by technology. NOW IS THE TIME TO GET A DOCTORATE DEGREE. The focus of this session was on the need for doctorates because there is a growing need for college and university professors to teach programs. I ran into Tim Passmore (Oklahoma University). He told me it was time for me to get my doctorate. I, Danny Pettry, am seriously thinking about it. I’d complete the program through Clemson’s distance education.